The prize for venturing outside after nightfall in February is a view of our most stunning evening sky of the year. 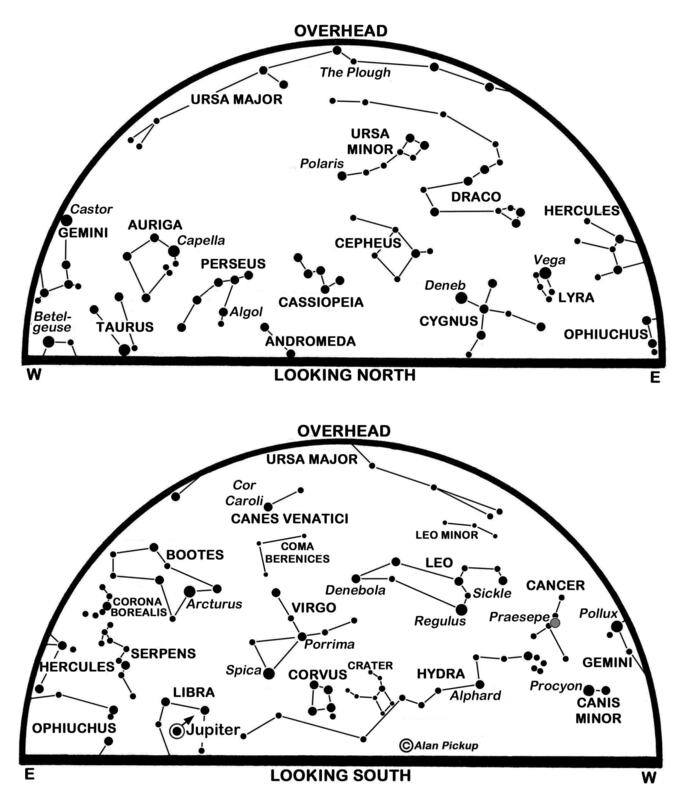 Venus, now closing in on Mars, blazes low in the west-south-west as the twilight dwindles while the conspicuous planet Jupiter is climbing in the east and the glorious shape of Orion is unmistakable in the south-east. 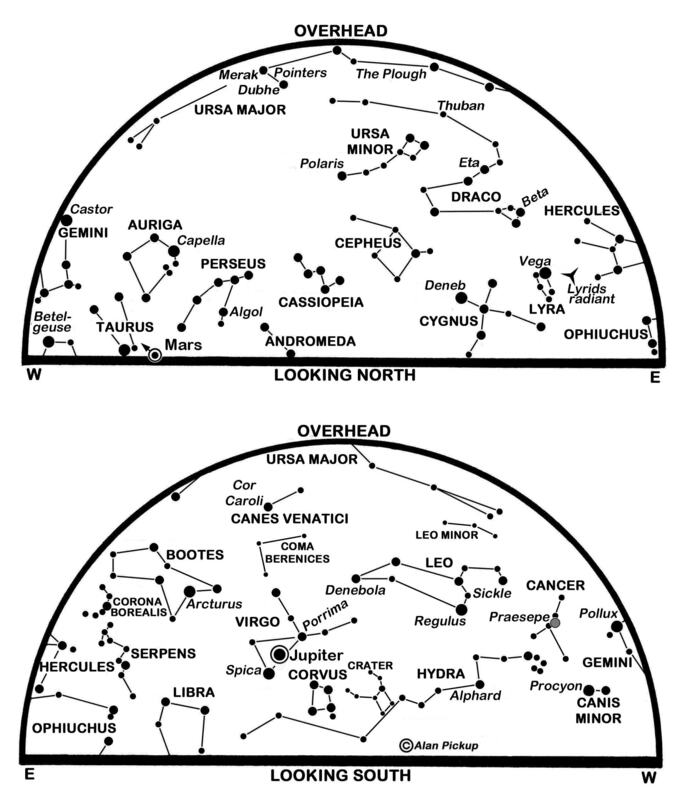 By our star map times, Orion has progressed into the south-south-west and it is Jupiter that dominates in the south-east. The line of Orion’s Belt slants towards Sirius which twinkles furiously on the meridian and westwards towards Aldebaran and on to the Pleiades in Taurus. Extend it still further, and across onto the western side of our northern map, to locate the area where we now find Comet Lovejoy. 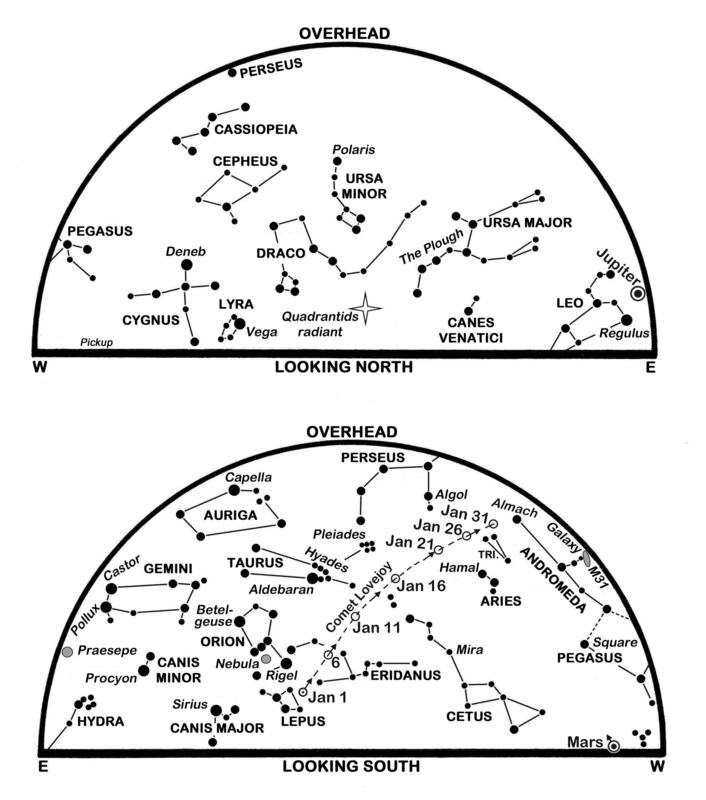 The comet has been an easy binocular object during January, appearing as a fuzzy ball of light climbing to the west of Orion and below the Pleiades. Indeed, it was visible to the naked eye in a dark sky while photographs brought out its long tail with several fast-changing spokes, kinks and knots and the striking green hue of its head, due to fluorescence from cyanogen and diatomic carbon. It peaked near magnitude 3.8 after passing closest to the Earth on 7 January and reaches its closest point to the Sun, perihelion, on 30 January. 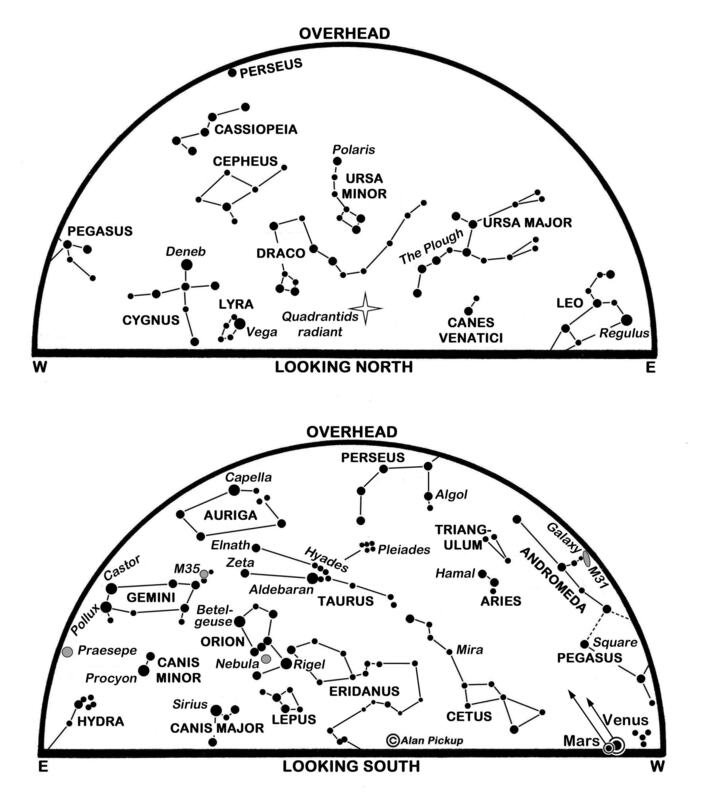 Our north map shows it approaching the star Almach, the upper (eastern) bright star of Andromeda, and it passes less than 0.7° above it on the night of Wednesday, 4 February. 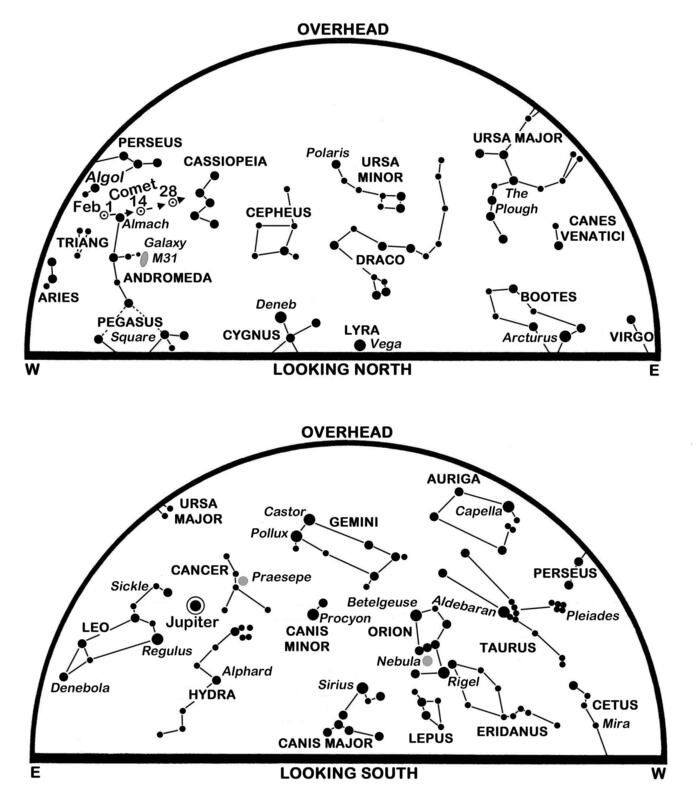 In fact, we will find the comet and the star within the same binocular field until the 12th or so. Now receding and fading, it is closer to magnitude five at present and may be magnitude 6.5 by the month’s end as it heads towards the familiar W-shaped pattern of Cassiopeia. Jupiter stands to the right of Leo’s Sickle and near the full Moon on Tuesday, 3 February as it edges westwards from Leo into Cancer. 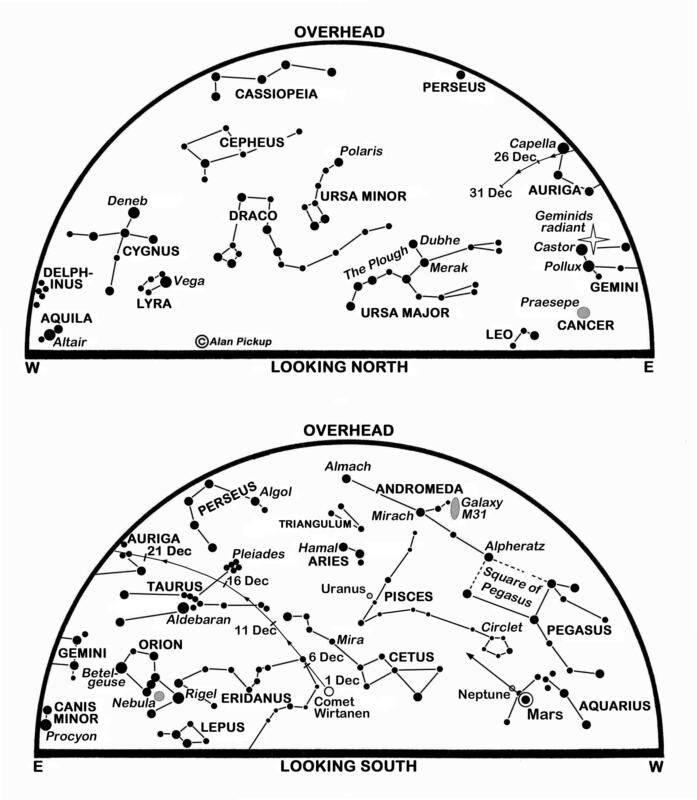 It reaches opposition in Cancer on the 6th when it stands opposite the Sun so that it rises in the east-north-east at sunset, is highest in the south around midnight and sets in the west-north-west at dawn. It is then at its closest (650 million km) and brightest (magnitude -2.6), and shows a 45 arcseconds disk through a telescope. Its four main moons are visible through binoculars, unless, that is, they are in transit across the disk or hidden beyond it. With their orbits still edge on to us and to the Sun, they also eclipse each other occasionally. The obvious surface features on Jupiter are the bands of dark and light clouds running parallel to its equator, but peppering these are streaks and spots that drift across the disk to betray the planet’s rotation in just under ten hours. 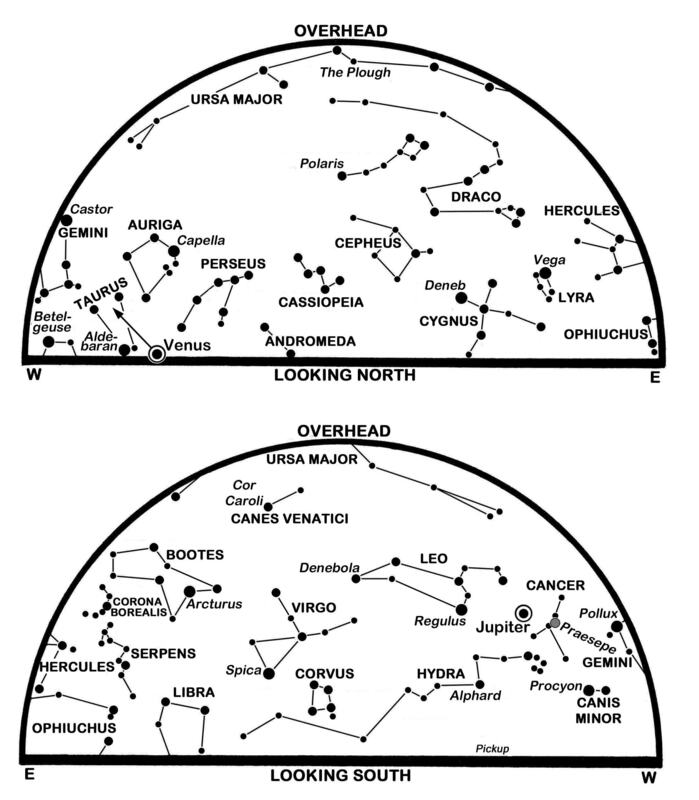 Since it is observable throughout our long night, we might inspect its entire meteorology in a single session if we had the dedication and enough cups of coffee. February sees the Sun climbs 9.5° northwards in the sky as the sunrise/sunset times for Edinburgh change from 08:08/16:45 on the 1st to 07:07/17:44 on the 28th. The duration of nautical twilight at dawn and dusk shrinks from 86 to 80 minutes. The Moon is full on the 3rd, at last quarter on the 12th, new on the 18th and at first quarter on the 25th as it passes just above Aldebaran. Venus is now established as an brilliant evening star of magnitude -3.9, its altitude above Edinburgh’s south-western horizon at sunset increasing from 16° to 23° during February so that by the month’s end it is visible for more than three hours after sunset. Viewed telescopically, its dazzling and almost-full gibbous disk swells from 11 to 12 arcseconds in diameter. Mars lies 10° above and to the left of Venus on the 1st, but is more than 100 times fainter at magnitude 1.2 and distinctly reddish in appearance. It is also a good deal smaller at 4 arcseconds and we will struggle to glimpse any of its surface detail. Both planets are more distant than the Sun at present, but while Venus is sliding closer to the Earth in its orbit, we are leaving Mars behind as it slips towards the Sun’s far side. The two are also drawing closer together in our sky so that Venus lies 0.8° below Mars on the 20th with the slender young earthlit Moon 4° away, below and to their right. Venus lies only 0.5° (one Moon-breadth) below-left of Mars on the 21st when their distances from the Earth are 212 million and 330 million km respectively and they lie 10° below-right of the Moon. By the 28th, Venus stands 3° above-left of Mars. Mercury remains hidden in our pre-dawn twilight but Saturn is a morning planet in Scorpius. Rising in the east-south-east at about 03:35 on the 1st and 01:55 on the 28th, it climbs almost 15° high into the south-south-east to south before dawn. As the brightest object low down in that part of the sky, it shines at magnitude 0.5 and surpasses the red supergiant Antares 9° below and to its left. Saturn is tracking slowly eastwards but is at present just 1° north of the star Graffias which appears double through a small telescope but really has many stellar components. The planet lies 4° to the right of the waning Moon on the morning of the 13th when a telescope shows its disk to be 16 arcseconds wide, while its rings span 37 arcseconds and have their northern face tipped 25° towards us. This is a slightly-revised version of Alan’s article published in The Scotsman on January 31st 2015, with thanks to the newspaper for permission to republish here.